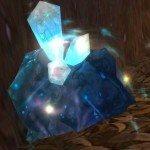 >Did you see Ore Crusher addon featured in mmo champion 1st February? 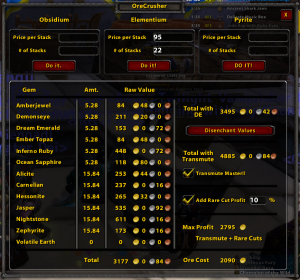 Did you know that Ore Crusher got updated to version 2 on February 4th?Ore Crusheris an in-game spreadsheet developed by Fusionpit and available from both Curse and WoW Interface, showing you results from prospecting and disenchanting. It’s a simplified version of the Spreadsheet that Killed them all, and it’s usable in game, no need to tab out and fire up your spreadsheet. I reviewed the Ore Crusher Basics two weeks ago. 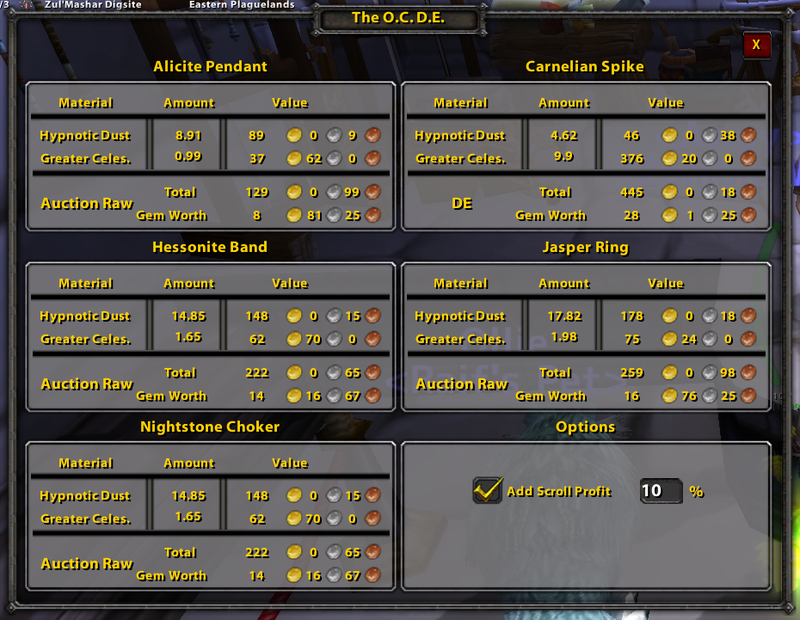 Fire it up, using /oc /theoc or /orecrusher, input your ore price/stack, number of stacks, and click DO IT. Ore Crusher populates the gems and other prices from your Auction addons. 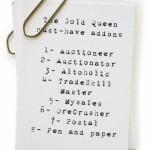 It can pull prices from Auctioneer, Auctionator, AuctionLite, AuctionMaster or Trade Skill Master. 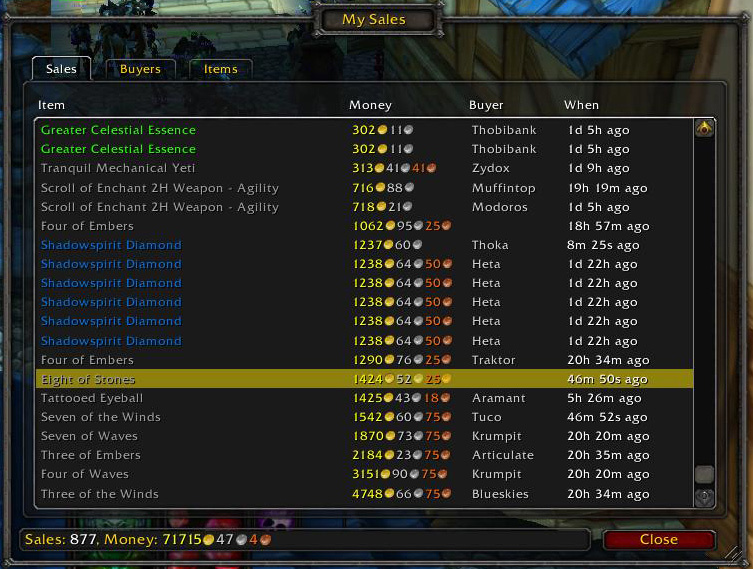 Set your preferred Auction Addon in the options window. Ore Crusher will even automatically enable selection of only the mods you have installed. Mouse over a green name for additional information via tooltip. “Total with DE” and “Total with Transmute” show both revenue and profit on each line. Q) All the values are “-“! A) Your auction addon isn’t scanned by OreCrusher until you press one of the “Do it” buttons. 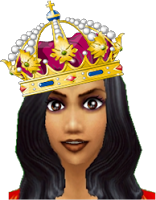 After inputting the price and number (and you only have to input the number of stacks, but The O.C. 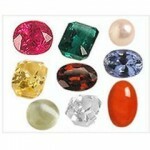 will not scan ore prices for you) just press the corresponding button and feel the magic! Q) I can’t seem to get prices for anything! A) Currently, a GetAll scan of the Auction House may not return all the info that it should. If you’re experiencing pricing issues, be sure to do a normal, slow scan using your auction addon. If your addon does not have a slow scan option, you will need to manually search for each item that does not have a price. Keep an eye on your preferred addon’s website for more information regarding this issue and possible fixes. Q) I get prices, but they’re slightly off! A) If you are seeing slight variations between the price listed by Ore Crusher and the price on the AH, the most likely cause is someone bought or listed additional items in the time between the scan used by The O.C. and looking at current AH data. 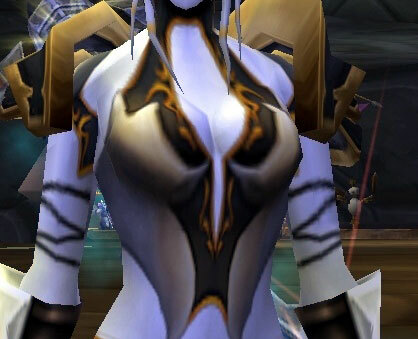 You may also be experiencing the undercut option of your auction addon at work. New transmute window! Shows uncommon to rare transmute values. New options window! 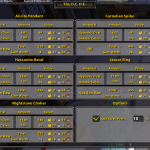 Set Multipliers, UI Scale, even pick your auction addon easier than ever! Reconfigured DE window! Some additional pricing shown. Expanded tooltips for DE and Transmute Totals. Now clearer, and with additional information. Max Ore Stack Price now shown in the lower right corner. Shows how much you can spend up to on the ore that you just DID. 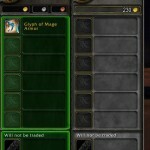 The Gold Queen writes about other Addons and Gold Making Strategies.